Arriving in Singapore, we all had food on our mind! We arrived at Singapore Airport late in the evening, and by the time we had met up with Devon and found our way into the city on the MRT, we were beyond hungry. We usually like to ask for food suggestions from the people we come in contact with so it was no surprise to hear Corinne start in on a conversation with the hostel clerk about hawker stalls. Out came the map and the other two workers on late night duty. Most of the discussion was between the three of them; what would still be open, what would be the best food for us, how long would it take to get there, would we be able to find our way there and then back again; or at least this is what it seemed like they were talking about. Between our jet lag and their accents, who knows what was really said. They finally came to an agreement: Lau Pa Set was best for us. With a circle on the map and a bus number to look out for we dropped off our bags and took to the streets. Our bus driver, as we would find throughout our stay in Singapore, was more than happy to help and kindly called out to us when our stop came up. We asked him again, as we looked dubiously out the bus door into a deserted financial district, if this was indeed the area. 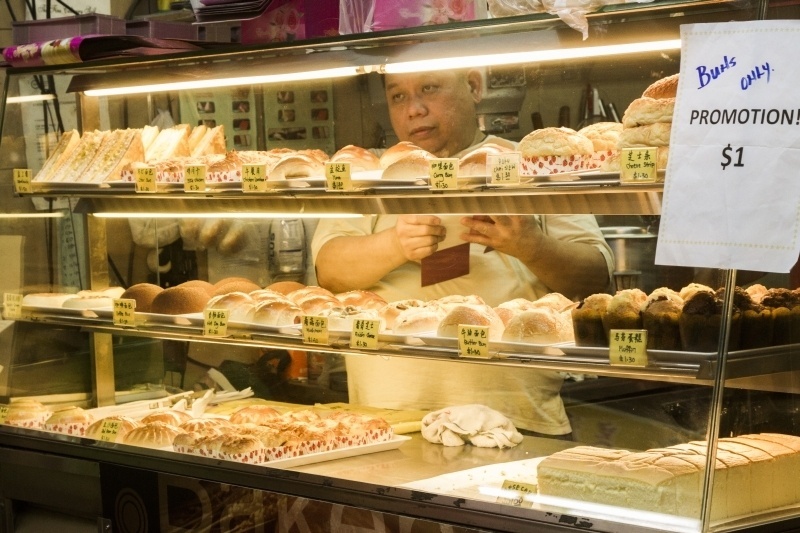 He smiled and pointed out the door and said “Lau Pa Set.” Consulting the map, we quickly set our bearings and started walking the block and a half to the circled location. Lau Pa Set, read the small sign on the corner pointing across the street into a dark, fenced off park looking area. Under renovations, read the signs on the fence. Great. We were not alone despite the late hour (by now it was at least 11:30). Another couple was consulting their maps and shaking their heads. This was it, but no hawker centers were to be found. We walked around the area a little hoping to find some late night stalls, but to no avail. Defeated we headed off in the direction of the waterfront, hoping to at least get some good night shots of the city skyline and something, anything, to eat. We weren’t disappointed with this, the waterfront along Fullerton looks out at the incredible Marina Bay Sands and we got there just in time to catch the last light show of the night. And while it wasn’t the authentic local food experience we were hoping for that first night, we did enjoy a spicy chili-crab hot dog down by the Merlion. We went to bed that night a little disappointed and hoping that we would have better luck the next day. Lau Pa Sat, 18 Raffles Quay, Singapore, Singapore (Downtown Core) is currently closed for renovations and expected to reopen in June of 2014. We were told later, much later, that satay hawkers set up on Boon Tat street, just behind LPS, in the evenings but we didn’t see them (probably too late). Waking up on our second day in Singapore we were determined to persevere and find our way to the best food stalls in town. Singapore is touted as a foodie Mecca, and all we’d managed to find so far was a chili-crab hot dog. I felt we were failing both as food lovers, as well as travelers! We decided for today we wanted to get out and experience the sights and tastes of Chinatown where we were sure we could remedy our previous failings. The MRT takes you right to the heart of Chinatown and only a few steps out of the station we quickly found a refreshing juice stall, followed up with a taste of durian. After a couple hours of exploration we were again famished and asked for directions to the nearest hawker stall center. This question was received and answered with a knowing smile by a friendly, elderly lady visiting the rooftop garden of the Buddha’s Tooth Temple. Maxwell Road Food Centre was right across the street. 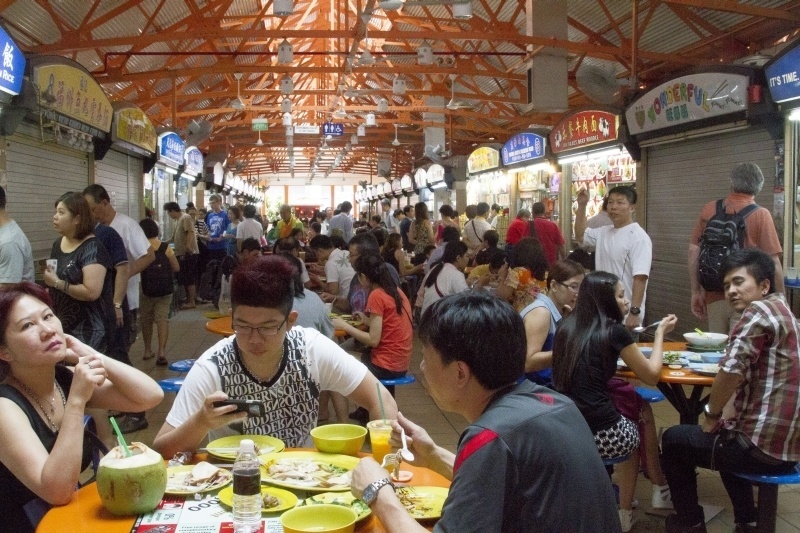 Walking through our first real food hawker center we were dumbfounded. The number of stalls and food choices was mind-boggling. OK, maybe it wasn’t that big, but there are more than 100 food stalls with a dizzying array of options. The first thing we saw was Hainanese chicken. This seemed like the perfect place to sample this iconic Singaporean dish. Now it was a simple matter of looking for the crowded stalls to find what would hopefully be the best. Later we would read about the fame and glory of Tian Tian Hainanese Chicken Rice, but on this day we tried it simply because it had the longest lines. The chicken was silky smooth with a hint of ginger and herb and came served on a pillowy bed of rice, cooked to perfection. We were in heaven! 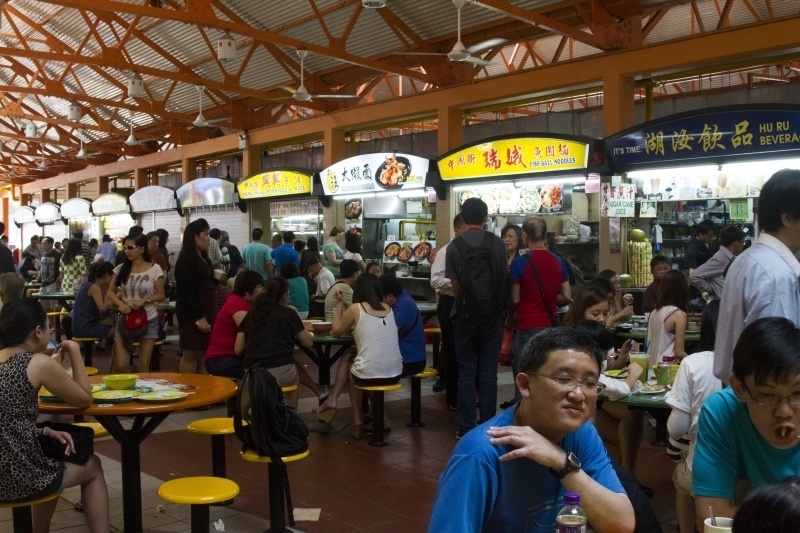 We had finally found the hawker centers and food sensations Singapore is famous for. Here’ s the address for our first! Maxwell Road Hawker Food Centre 1 Kadayanallur St, Singapore 069184, Singapore (Downtown Core). What do you do when you first arrive in a new place? Go for food, go to bed? Get your bearings? Muza-chan…It was all delicious! Yum! SJ Yes! I will forever associate Singapore with food. There is lots to do and see, but for me it was all about the food! I have never been to Singapore. But, after looking at your pics, I have food on my mind! The last photo is mouthwatering! 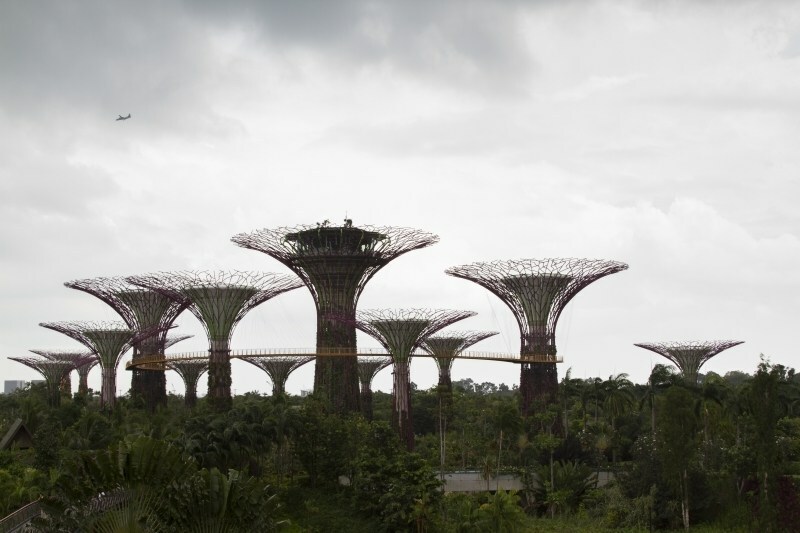 Alex, I think you would love Singapore…Along with all the delicious food, there are so many photographic opportunities! You are people after my own heart — foodie loving travelers…so you know my answer is food first! My hubby? Nap first. I had no idea that Singapore was such a food mecca. Thoroughly enjoyed reading this post! Amy It just goes to show…we love life! I was surprised at the dizzying array of restaurants and food choices there, too….but loved it! We were there exactly 2 weeks ago digging into roti prata and other local dishes. Maxwell Hawker Center was our favourite one! Agness Since we’ve been back, we keep trying to find a way to make some of the food. We miss it that much! I have to say it would depend on what time of day we land but getting to accommodation is usually first port of call. having said that if I spot some tasty looking local food I can always spare a minute or two to sample local life. All in the name of culture!! I agree Charli! We like to take those cheap flights, so we always seem to get in at night…many times we’re ready to eat! 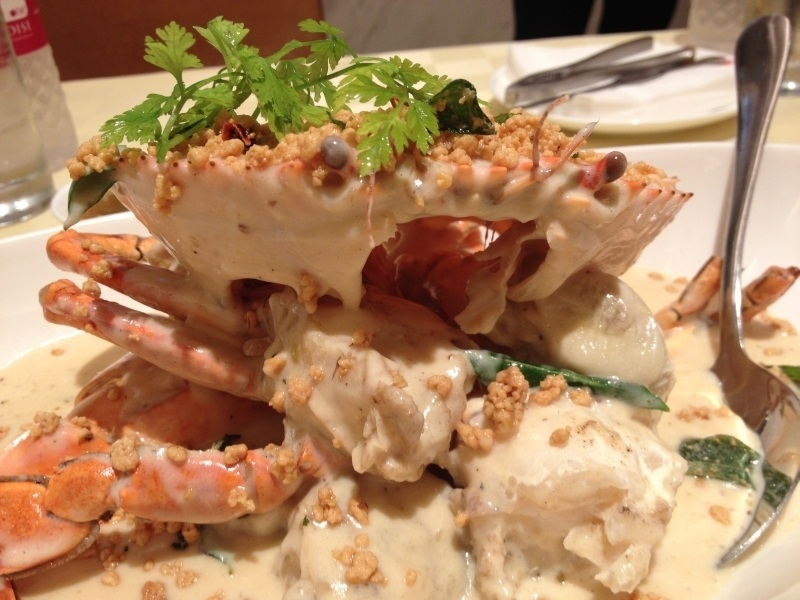 We loved the Singapore food scene during our visit many years ago. Glad you guys were able to find the hawker centers. I can’t even remember those places we ate at but they were all good. I almost wish I had a blog back then to record all those places. Depending on the time of our arrival, we usually try to check into our hotel to drop our luggages. If it’s in the morning, we usually walk around to get a bit of an orientation. If it’s at night, the kids are usually too tired so we just go to bed and start fresh the following morning. Hi Mary, I agree. Wish I’d been keeping much better notes all the years I traveled before blogging. After I watched Anthony Bourdain’s travel show on Singapore I was hooked to definitely go there someday. And first thing that enticed me, what’s new, was the food, Corinne. He also commented on how clean all of the food places were including the street carts,etc. Did you feel the same way? Mike, I can’t tell how impressive it is. Singapore as a whole is a super-clean city and I never saw anything to be concerned about. You could probably eat off of the floor; it was that clean! I loved it! I hope you make it there someday. This is an excellent question for taxi drivers. They all have their opinion! Often they won’t recommend a whole centre, but they know their favourite stalls. It’s here for chicken rice, or there for sambal fish, and somewhere waaaaay across town if you’re in the mood for fish head curry. Can’t wait for Lau Pa Sat to open up again though! Bronwyn, good point! We took buses all over the city and a couple of times were able to ask the drivers questions, but mainly they were too busy working. I agree – ask the locals! Love those Hawker Centers! We were so lucky to have Singaporean hosts show us the ropes and order some stuff for us, as well as what we could pick out. Oh my. Deliciousness. Donna, You are right! There is nothing better than to have a local show/tell you where to go and what to do. I try to search that our wherever we travel. Happy C day! Travelling to Singapore? FOOD is coming into my mind! Jack…Yes!It’s all about the food! I wish i’d tried the Maxwell Hawker Cenre – I think we went to the Newton one on our recent trip to Singapore. I absolutely fell in love with the food in Singapore – all so delicious! I also tried the chicken rice and could happily live off that if they had it easily available in England!! Shikha, I know what you mean…so delicious. Happy holidays!